I am so honored that a Hillel colleague (and friend! ), Alicia, is writing for us this week. And, in true Hillel fashion, she has a lot to say about community, amazing students, and the responsibilities that weren’t in the job description. One of my favorite things to do is make Shabbat for other people. When I say “make Shabbat” I mean hosting a meal, because, for me, the meals are central to the Shabbat experience. 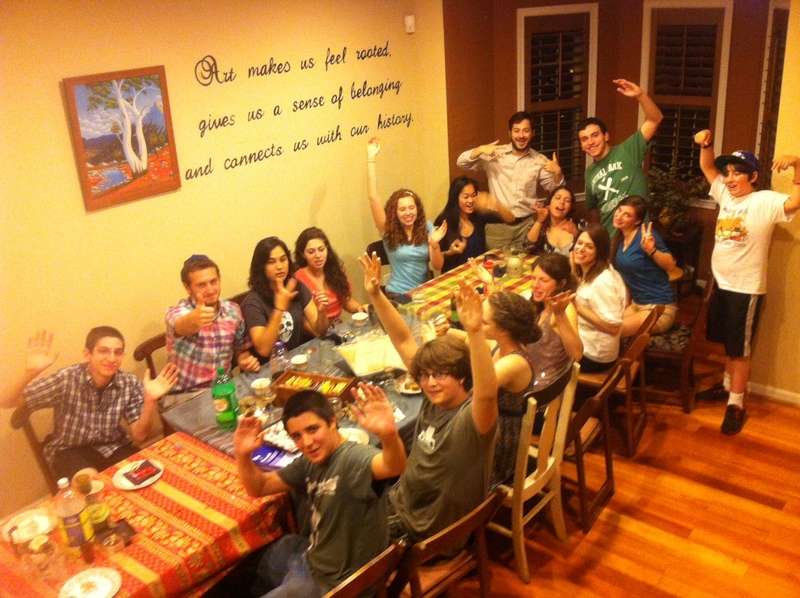 For the last four years I’ve rarely had the opportunity to make Shabbat in my home; then again, 32 or so weeks a year, for the last four years, I’ve made Shabbat dinner with and for the students at University of Delaware Hillel. This week was my last Shabbat at UD Hillel. learned that I love to make soups for them. In my first year at UD, a group of students gave me an incredible cookbook: The Soup Bible, which has inspired several of the soups I make (I’m terrible at following recipes!). And, more importantly for me, I have loved serving the soup at every Shabbat dinner I’ve worked at Hillel. I realized a few weeks ago that I had not made Hot & Sour soup this year, which is a favorite with the students, so I planned the rest of the menu around the soup. ginger, pepper and garlic. Continuing the Asian/ginger theme, I added ginger to broccoli and quinoa and vegetables. Of course, the star of the meal, and all I ate, was the soup! isn’t supposed to know about.” From the moment the student speaker started, I was crying, and it only increased when a colleague and friend took his turn. I was incredibly grateful when we moved into Kiddush (the blessing over the wine) and the attention was off me. I was so excited when two of our graduating seniors, one who founded the Challah for Hunger chapter on our campus, lead us in hamotzi (the blessing over the bread). And, I was thrilled that I got to serve soup. I have loved serving the soup every week, saying hi to every student who is there – I think what made me most aware of my presence in the community was when one student, who I’ve only spoken to in the soup line, said how much he will miss me. Most weeks I keep the cleanup moving; this week, I didn’t even know that it started, as student after student came to hug me, to thank me, and to wish me well. I cried, I laughed, I was overwhelmed with the love. 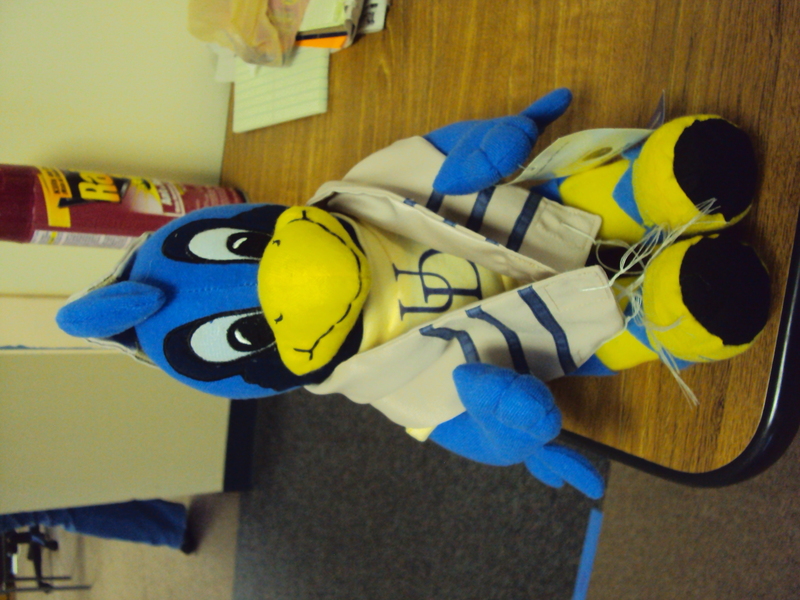 At the end of the night, I sat with a group of my girls to open a gift they put together for me: a pinny from one of their events, Banagrams b’ivrit (in Hebrew – I introduced many of them to Banagrams last year), and a stuffed animal of YouDee (the UD mascot) with a tallit (prayer shawl) and kippa (head covering) that one of the girls hand sewed. If you ask my students what my favorite thing to talk about is, I think they would (correctly) answer community. For the last four years, I have been blessed to facilitate the growth of the Jewish community at UD. I have watched students come and go, and the community grow and strengthen, one pot of soup at a time. soy sauce and rice vinegar (to taste). Stir in a few shakes of chili flakes (more if you and your guests like spicy food) and a small scoop of sugar (probably a couple tablespoons). Lightly beat (or pretend to) egg whites, then pour slowly into the soup, while stirring. Soak the cloud ears in hot water for 30 minutes, or until soft. Drain, trim off, and discard the hard base from each, and chop the could ears roughly. 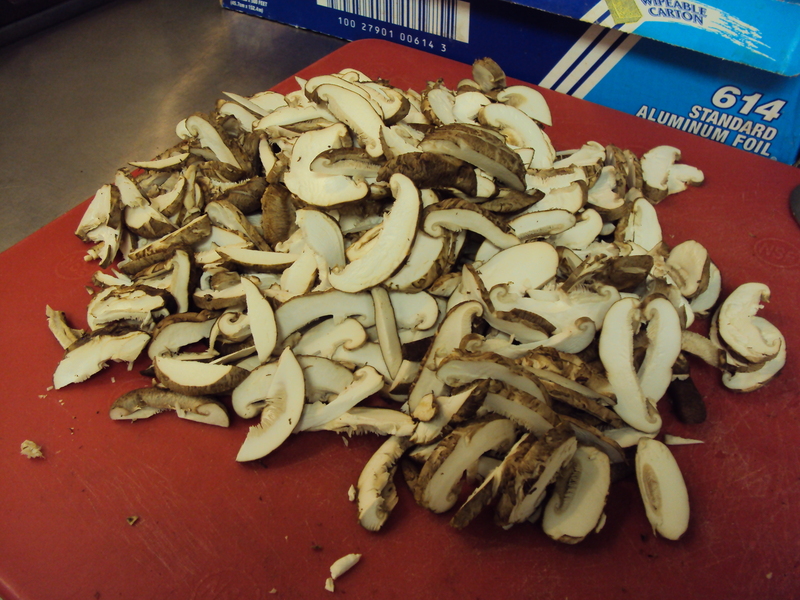 Remove and discard the stems from the shiitake mushrooms. Cut the caps into thin strips. Cut the tofu into ½ inch cubes, and shred the bamboo shoots finely. Place the stock, mushrooms, tofu, and cloud ears in a large saucepan. Bring the stock to a boil, lower the heat, and simmer for about 5 minutes. Stir in the sugar, vinegar, soy sauce, chili oil, and pepper. Stir the cornstarch to a paste with the water. 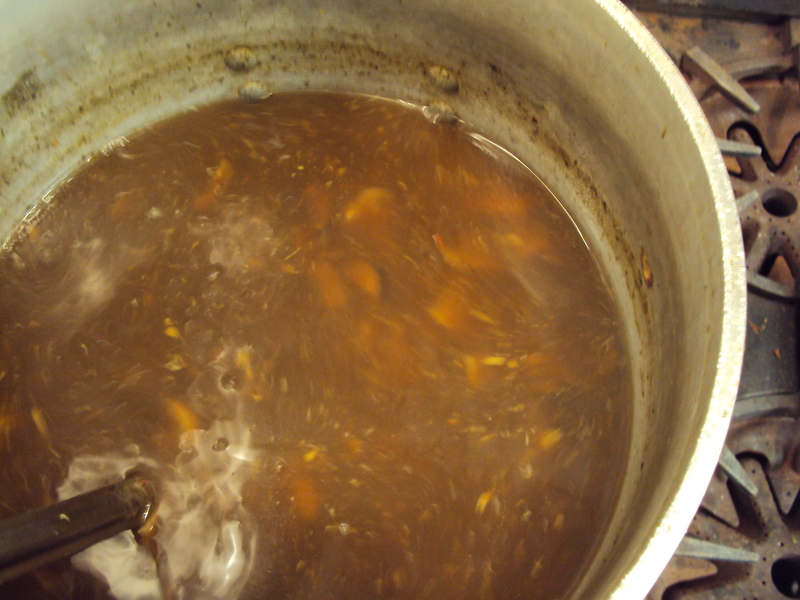 Add the mixture to the soup, stirring until the soup thickens slightly. Lightly beat the egg white, then pour it slowly in a steady stream, stirring constantly. Cook, stirring, until the egg white changes color. Add the sesame oil just before serving. Ladle into warm bowls and garnish each portion with scallion rings. This week’s contributor is…me! 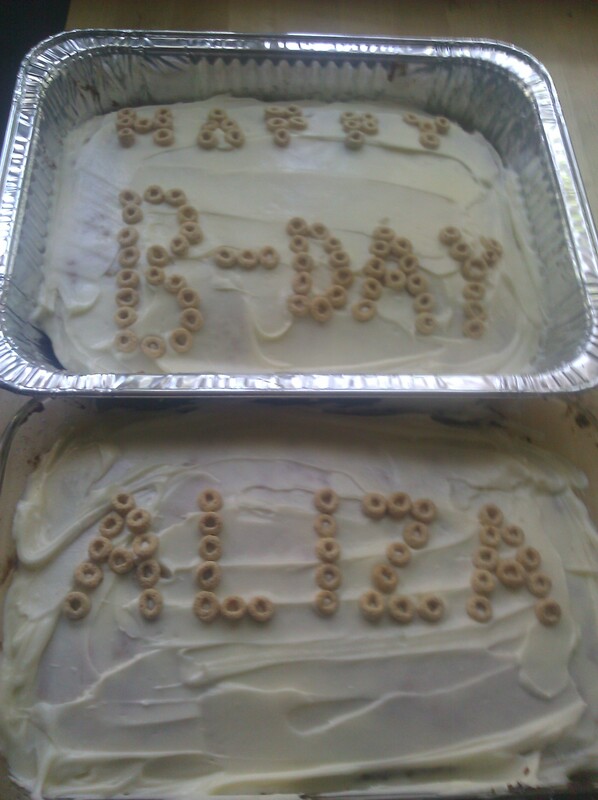 I’m excited to be writing for my own blog again, and there are three main reasons that you’re reading about my Shabbat this week: 1) we celebrated Aliza’s birthday on Shabbat, 2) I had a post published at the Jew and the Carrot about the blog and felt like I’d been neglecting it, and 3) no one else signed up. In conclusion, 1) you’re definitely going to want to keep reading to see the cute pictures below, 2) if you heard about this from the Forward, welcome, and 3) sign up to blog for a week! A year ago, I was blogging from a hospital room while a teeny 5 pound baby wormed her way into my heart. 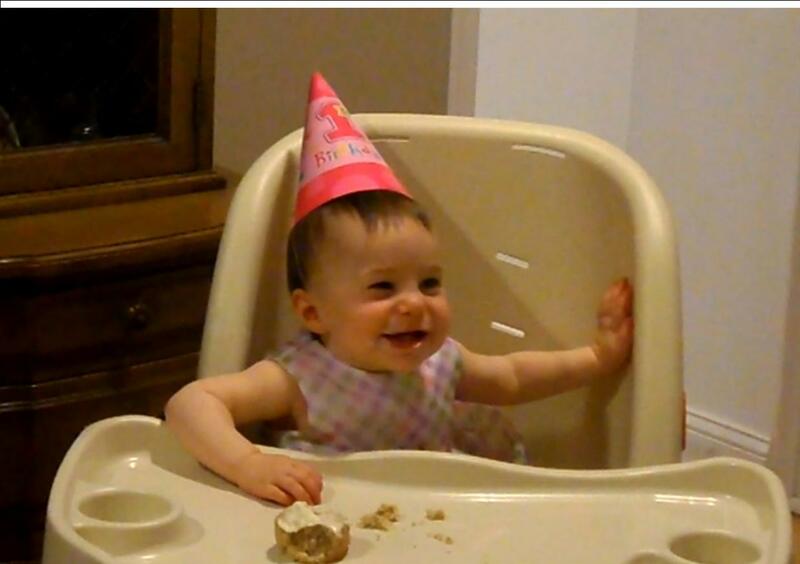 In a year, that teeny thing has more than tripled her weight, cut a mess of painful teeth, taken her first steps, said her first word, and been described by every stranger in Philadelphia as “the happiest baby in the world.” Not bad for a year. To celebrate this momentous occasion, I thought someone should throw me a party. Instead, I threw two parties and then basked in the amazingness of what Marc and I have accomplished (namely, not seriously injuring ourselves or Aliza despite profound sleep deprivation). Digression: The summer after I graduated from college, I drove cross-country and then spent a couple weeks staying in California in a place I’ve since dubbed “the hippie house.” I really didn’t have anything to do there other than read Howard Zinn’s A People’s History of the United States and help harvest potatoes, so one day I wandered into the kitchen, found some rotten bananas and a vegan cookbook, and got to work. Since none of the residents seemed to be really sure about who actually lived there, they hardly seemed to notice a random east-coaster baking in their kitchen. When I got back to real life, the best thing I’d taken home with me was this recipe, and there was something really lovely for me about making this recipe that I learned at such a particular point in my life for my daughter’s birthday. Couldn’t’ve predicted that one ten years ago. Preheat the oven to 350. Cream the butter and sugar, then add flour, baking powder, and baking soda. Add the remaining ingredients and mix well. Pour into a greased loaf pan and bake for 50 minutes, or into any other shaped pan, and keep checking it, or muffin tins and bake for 20 minutes. I highly recommend smothering in cream cheese frosting and calling it cake. I recommend against using Cheerios as decoration, though, because they get really, really soggy. I promised cute pictures, plural, and I’m pretty sure there’s nothing cuter than this. Kosher, which technically when translated, means “proper or fit,” was the theme of the evening – although not by traditional standards. We focused on eco-kashrut as our dinner theme (which was by request of our students, but a value that my husband and I practice in our home). I got chills when one of our graduating high school seniors stood up to tell the group of junior high and high-schoolers from our Confirmation Academy about where our food came from (like which farm and how far it was from Philly), and the environmental impact of locavore consumption. All the food choices were intentional. Our Challah was infused with good intentions at Limmud’s Deep Breath Baking. Our soulfully delicious dinner of fried Grow & Behold “happy chicken” (re: organic, local, free range, sustainably raised and kosher), waffles, kale chips (my favorite, see recipe below), and Cinco de Mayo Mexican wedding cookies (also my favorite! ), was all procured and prepared by our students and youth group adviser, a social worker and food blogger(!!). After dinner, one of the youth group student leaders led a discussion on “kosher” behavior, more specifically, peer pressure. Her peers were encouraging and supportive all the way through the presentation. We concluded the evening with Eli on the Churanga (an instrument we got on our recent honeymoon in Ecuador), our education administrator wailing on the harmonica, one student making my Texas heart melt playing the washboard, and one student with a dried gourd instrument, all rocking out to a Haskivenu / One Day medley. Even when the thunder joined into our song session our spirits couldn’t be dampened. What a soul-filled (and food) Shabbat experience!